SEO and its endless progression is showing no signs of abating. The rate of change is fuelled by Google’s rolling algorithm updates, which in turn are a reaction to user intent, the evolving mobile landscape and the relentless growth of user generated content. To help keep you informed of the latest SEO strategies and tactics, here are the 10 most popular SEO questions and answers we have encountered in 2017 so far. 1. Do keywords still make a difference to SEO? If you’re fully up-to-speed on SEO, you’ll know that a huge focus will be on building backlinks and authority and thus increasing your rank. So what about the humble keyword? Does it still play a role? The answer is yes, of course, but things have evolved considerably. Since Google Hummingbird, we have migrated from keyword search to semantic search. It means that old school techniques of keyword repetition have long gone (thankfully!). Topical relevance and user intent (see next question) are the de facto way of carrying out keyword research and creating a successful content strategy. Whilst keywords still play a very significant role in SEO, you can’t lose sight of other factors. 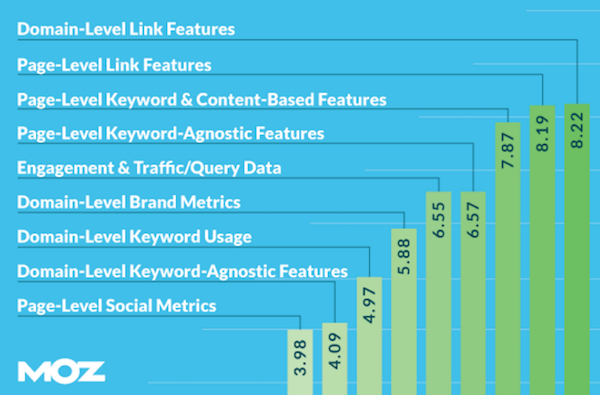 The last Search Engine Ranking Factors survey from Moz reveals the integrated and holistic nature of SEO. The research points to the fact that keywords are one of the many signals that need to be considered in a truly holistic SEO strategy. 2. How does user intent relate to SEO? In the last few years, Google’s updates has been focussed increasingly around user needs and their search experience. You’ll notice this with Google features such as Featured Snippets and infinite People Also Ask boxes (see below), but also by analysing search results. Increasingly, the content that tends to rank higher is the content that Google believes is most valuable and relevant to readers, be it UGC on community forums, FAQs, articles, guides or tools, often over and above content that sells. The SERP example below classically illustrates this. Google is displaying zero product pages despite my product search. By carrying out persona development, you’ll start to understand the needs of your users. Are they novices or experts? Which part of the sales funnel are they in? What are their pain points? And ultimately what is their goal? The answers to these questions will dictate your SEO content strategy, and on a micro level, how user intent translates into keyword searches and content requirements. 3. Does migrating a website to HTTPS help with SEO? In 2014, when Google announced its algorithm update was incorporating HTTPS as a ranking signal, it was estimated that less than 1% of queries would be affected. However, moving forward to 2017, Peter Myers of Moz recently wrote that 50% of page 1 results are now HTTPS, with a prediction that 65% of page 1 could be HTTPS by the end of this year. So, does HTTPS offer SEO value? Yes. But is the trade-off between development costs vs SEO value really worth it? If Peter Myers is correct, it would seem that HTTPS should definitely be on your development plan. But, aside from SEO advantages, HTTPS offers conversion optimisation value, as users are more likely to trust and engage with a secure site. Visitors to your pages can see whether you’re delivering a secure page based on the HTTPS in the URL, and the small padlock icon that’ll appear in the browser address bar. Numerous studies have shown that these small visual cues reassure visitors and can increase conversions. If you’re about to migrate to HTTPS, you may find this SEMrush post of use. 4. 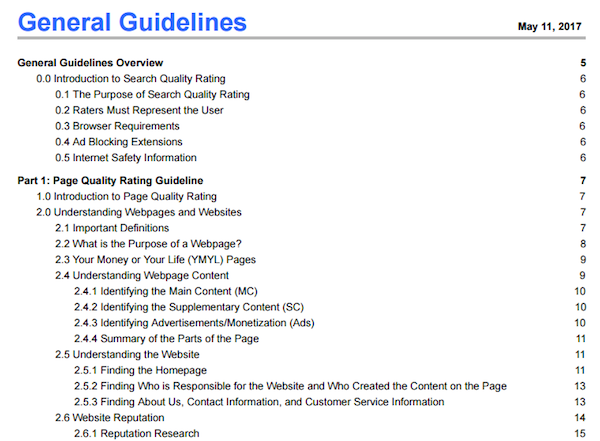 Are UX signals a ranking factor? Over two years ago I wrote about Google’s obsession with UX discussing factors such as page speed, mobile UX, hidden or click-to-expand content and Google’s dislike of ads “top heavy” above the fold, all of which influence SEO performance. So, UX and its relationship with SEO is not new. To corroborate this further, Wordstream wrote a fabulous post 6 SEO experiments that will blow your mind that demonstrated how clickthrough rate (CTR) in SERPs, as well as high bounce rates back to search (AKA “return to search”) had an influence on SEO. All signs show that UX signals are becomingly increasingly relevant to SEO, starting with clickthrough data at the search engine results page itself, and throughout the site too. 5. Does website design affect SEO? If your website has pink flashing GIFs, you use Comic Sans fonts and your visitors fully engage with your website, then keep it up! Google is not fixated on your use of colour, fonts or other aesthetic features. Google isn’t even that fussed with your page layout until it starts to impact on your user experience. It’s worth having a scan of the Google’s search raters’ guidelines. Its 157 pages demonstrate how each page should have a clear “purpose”, and that the “main content” of your page – typically the headline, main copy and supporting main images – should clearly demonstrate that purpose. Furthermore, your “supplementary content” – typically supporting navigation, related content, footer links etc – should aid the user journey in a clear fashion. Whether you achieve that with a rainbow of colours is your choice. The upshot is that design values themselves are not as critical as the page itself performing its duties, delivering value to the user and helping that user achieve his/her goal. 6. Do social shares improve SEO performance? Whenever I run an SEO workshop, it’s almost guaranteed that someone will ask if social media links count as regular backlinks and improve search rank. Let’s first talk about the difference between correlation vs causation. A fair few studies have demonstrated that web pages with a healthy number of social shares tend to rank better. However, that’s correlation not causation i.e. we don’t know that the social signals caused the increase in rank. More likely it was due to the content being worthy of good backlinks and thus gaining authority. The second question is: does Google crawl all social content? Although Google’s resources and capabilities are huge, they are still limited when it comes to crawling all social content, especially as it is volatile and changing by the second, making it imperfect. If Google doesn’t have confidence in a signal and is missing data about it, the chances that it is using all of it in its ranking algorithm is unlikely. This is nicely summarised by Matt Cutts below (and whilst this video is a few years old, evidence suggests that this is still current). Looking beyond the direct SEO effect of a social media share, if you take a look at a multichannel funnel, you might well notice the positive impact social media has in providing assisted conversions. The example below shows that social media provided 30 “assists” and 15 “last click” or “direct conversions”. SEO cannot be seen in isolation anymore, and the integration of social media performance into the SEO mix supports its role in SEO in more than one form. 7. 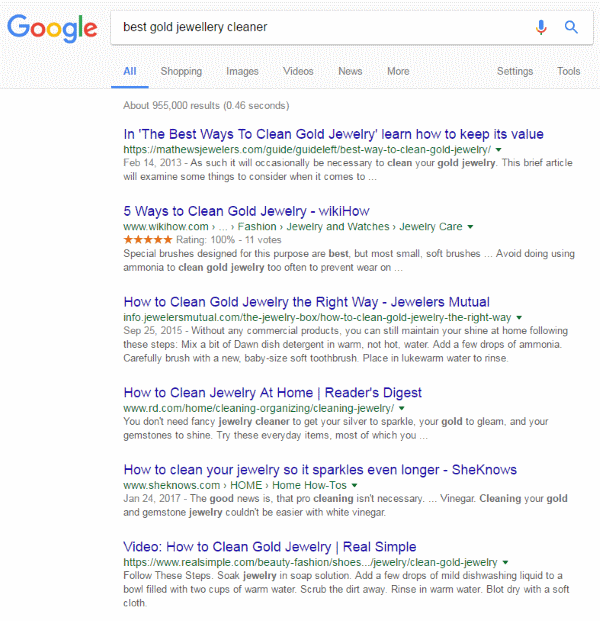 What are Featured Snippets and People Also Ask boxes? 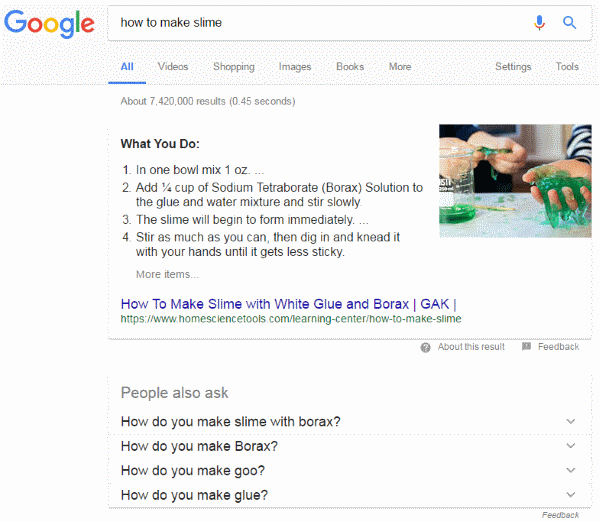 At the moment, there’s a lot of discussion around Featured Snippets (sometimes referred to as “position zero”) and infinite “People also ask” (PAA) content in SERPs, both evidence of Google’s machine learning. Both reside at the top of SERPs and feature heavily when search queries are Q&A based. Both spaces are very much coveted by SEOs and heavily rely on providing Google, and of course your users, with the right content. Featured Snippets and PAAs have actually been around for a while; in fact, People Also Ask boxes have seen a 1,723% growth in SERPs since mid-2015. Research has also shown that a single PAA can show up in 21 unique SERPs, providing some great real-estate in Google results. There aren’t too many tools that allow you to measure Featured Snippets, Knowledge Graph content and other SERPs features, but one to try is SEMRush, as illustrated below. 8. What is structured data and does it help with SEO? Structured data is a system where names and values are paired, in order that search engines can easily categorise and index content. A subset of structured data is microdata. Perhaps most commonly conflated with microdata is Schema.org, a collaboration between Google, Bing and Yandex, that provides a particular set of agreed-upon definitions for microdata tags. Microdata is probably best known for creating rich snippets, such as event listing, recipes, customer ratings and product info such as prices and stock levels, allow of which appear in search results. There’s debate around whether microdata improves rankings, but what is indisputable is the effect it has on increasing visibility and clickthrough rates within SERPs. If you haven’t implemented any structured data, it’s probably easiest to pop over to schema.org and have a look around. It’s not for the faint hearted, so best to wear your technical hat when doing so. And, if you want to test your own structured data implementation, visit Google’s snappily titled structured data testing tool. 9. 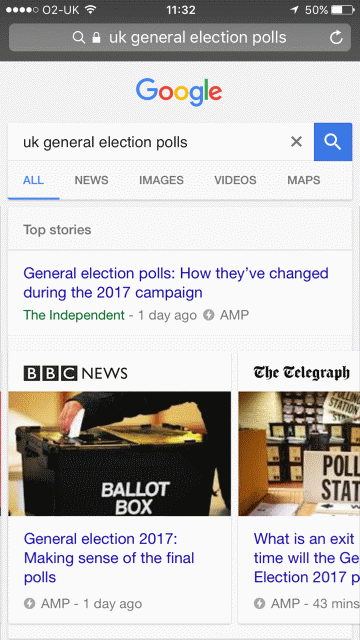 Do accelerated mobile pages (AMP) rank higher than regular ones? Last year I wrote a post explaining accelerated mobile pages and their role in SEO. A question we get asked is whether AMP content ranks higher than non-AMP content. As I mentioned previously, there’s no evidence from Google that AMPs will improve your SEO rank. Currently, AMP content appears either as “top stories” at the top of Google search results, or throughout SERPs, and often beyond page 1. So, unless you are a news site appearing in top stories, your content may rank anywhere. It’s still worth noting that according to Google’s VP of Engineering, David Besbris, when there are two identical pages, one AMP and one mobile-friendly, Google will serve the AMP page on mobile devices. 10. What is voice search and does it impact on SEO? One of the fastest developing areas of SEO is voice search. Voice search is a technology that enables users to search by speaking search queries aloud, rather than typing them into the input field. Google recently claimed that 20 percent of mobile queries are voice searches, and that voice search is growing faster than conventional typed search. Marketers and SEOs are starting to recognise this growing area. In fact a survey of 39 SEO experts listed voice search third in a list of the biggest SEO trends for 2017 and beyond. (And interestingly, AMP/mobile content scored first in this particular survey). Voice-based queries are clearly different to typed queries, with searchers demonstrating longer search queries, including questions, and sometimes complete sentences. My own personal use of voice search is mostly confined to finding directions, phone numbers and opening hours when driving. Work that Google is doing in machine learning to generate Featured Snippets and People Also Ask boxes is very much a reaction to voice search. The question on everyone’s lips (no pun intended) is how voice search will impact SEO. Brands will need to react to voice search by understanding user intent and language. More conversational, FAQ-based content will need to be planned and executed. But also the use of microdata – especially organisational content, such as location and contact details – will help Google better understand and deliver content users are searching for.